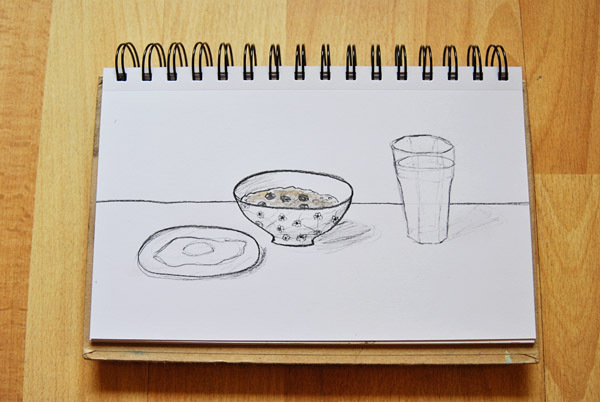 Charcoal sketch of real food for breakfast. My healthiest habit of the year has been changing up my diet and exercise with the help of Ali at Complete Physique. I'm not perfect at the diet, but I do my best and I like that I have some accountability. The exercises have been an awesome change up from my standard running routine, and have made me faster. This past Saturday, I shaved 3+ minutes off of my 10K time. And, in 4+ weeks, I've lost almost 4". I feel stronger and leaner, which is awesome. I don't have a picture right now, because my current lens doesn't have auto-focus and I can't get my tripod photos to turn out right, but I'm getting a new one for Christmas, so it's coming. In 2012, I'd like most of what I'm doing to just be a habit, and not part of a program, I also want to start training for triathlons again, when I concentrate too much on running, I just get injured and don't really see progress. Congrats on the successes. I love your little drawings!